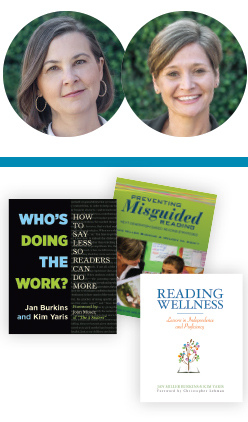 Jan Burkins and Kim Yaris, authors of Who’s Doing the Work? How to Say Less so Readers Can Do More (2016), and of Reading Wellness: Lessons in Independence and Proficiency (2014). Both titles provide practical ideas for teaching students to become increasingly independent and proficient in an age where heavy teacher talk is the status quo. With 50 combined years of experience in education, they are passionate about helping teachers navigate, understand, and implement standards based instruction without sacrificing their inner teacher. In their current role as staff developers, they work closely with schools and districts, facilitating professional learning, conducting in-class demonstrations, and developing curriculum.